I am a crafter and I’m not ashamed to admit it. I am one of those annoying mums who can turn a loo roll tube and an empty washing up liquid bottle into Tracy Island and who shows up to the school Christmas Fair with a hundred homemade cards to sell. But you see I’m not in the least bit sporty and I can’t carry a tune in a bucket or dance with even a modicum of grace; my only talent is making things, so please don’t hate me. I have been knitting, embroidering, crocheting and papercrafting for as long as I can remember but I also love to learn new crafts. Before I became a mum my free time was always taken up with one creative course or another, jewellery making, metal work and stained glass to name a few, but there are so many amazing crafts out there that I’ve barely scratched the surface. That is where this bucket list comes in. It’s a list of crafty pursuits that I would love to be able to do and I’m setting myself a challenge to tick off as many as possible before the end of the year. Sew a quilt – Whenever I read Alicia’s or Carie’s blogs I get serious quilt envy. Their blogs are like food for a crafters soul. Sew an item of clothing for Bubs – I’m going to start slowly by refashioning some of her outgrown dresses into skirts. Sew an item of clothing for me – I made myself a knee-length skirt years ago that was basically a rectangle joined on one edge with an elastic waistband. I would like to try making something a bit more interesting (and fashionable!) and I have an Amy Butler tunic pattern that’s been sat in my craft stash for far too long. Learn how to paint with watercolours – Some of my favourite scrapbookers create stunning backgrounds with watercolours. I want to be able to do that too. Make an item of furniture (flat pack doesn’t count!) – Have you ever visited Ana White’s website? She builds fabulous items of furniture using supplies picked up from her local hardware store. I have my eye on this set of storage bins as a starter project. Make a teacup candle – I think these are so pretty and probably the easiest craft on this list. It doesn’t hurt that half of our garage is taken up by my vintage china collection. Learn how to do sashiko embroidery – I already own a couple of books on sashiko and a stack of oriental pattern transfers, I just need fabric and thread. I’m not blessed with oodles of free time but I do have two mornings a week as well as a little bit of time after Bubs has gone to bed, although she has ears like a bat and if there’s even a hint that mummy is having fun she will wake up and then the only thing that will be created is a ruckus. I know there are crafters out there with two or more children and/or full-time jobs who make amazing items with alarming regularity – I suspect they have mastered the art of sewing in their sleep though – so I really ought to be able to check at least one thing off the list. *The image of the painter was purchased from Lovely2CU on Etsy and the frame is by Angie Makes. I just added a dash of Photoshop. 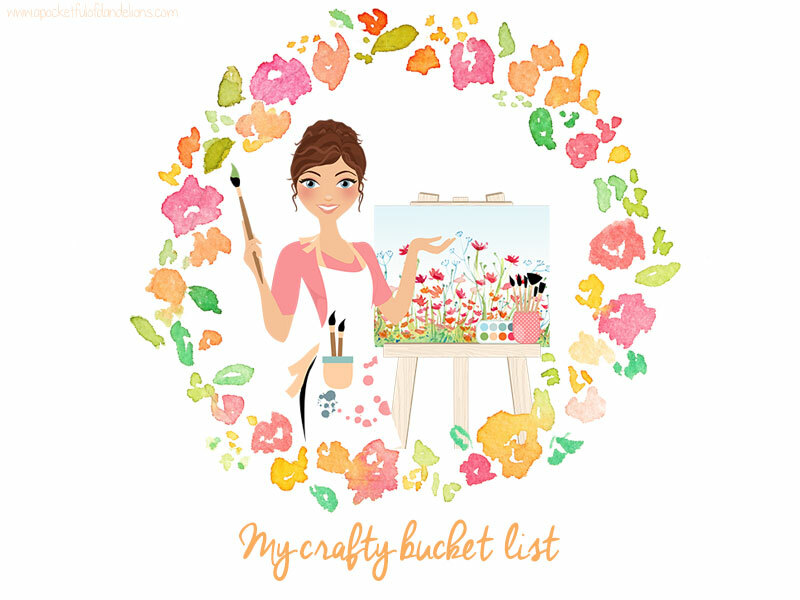 Fab bucket list Vickie; I love crafts but I’m not as talented as you – usually my ideas are grander than my capabilities!! Thanks for introducing me to Ana White’s website – those storage bins look like a great first project. I am in the process of making Rosalie a sand and water table…I’ll blog about it when it’s done 🙂 Good luck choosing your first project! Ana White’s site is an internet wormhole, I’m convinced, as I seem to lose hours there. 🙂 I’m really looking forward to reading about your sand/water table! Good luck with it. Fab list. I am afraid im not crafty at all. I have just brought a vintage wicker chair from eBAY to upcycle for Oliver’s new room (fingers crossed for me please!) I love reading how talented other people are so please share all your makes, I need as much inspiration as possible!! Oh they all sound fantastic – I’ve done the first three, tried the fourth, never contemplated the fifth, and the last two are on my bucket list too! Just go for it – try all of them at once! !